Unbelievable home and property here plus large 1 bedroom living quarters in barn. 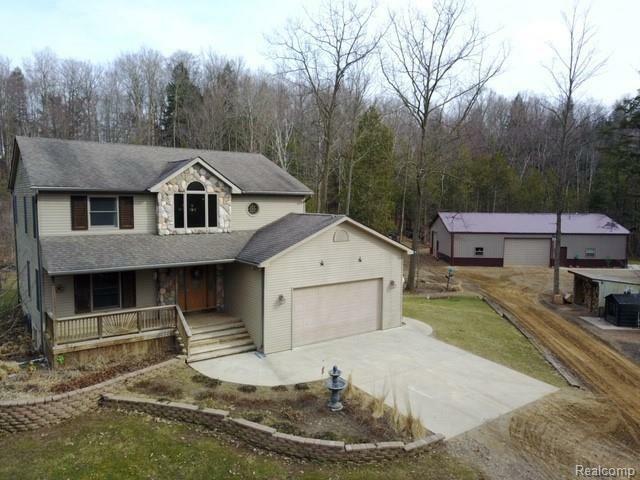 Over 5 acres of complete privacy and totally wooded. Top notch quality throughout home. Too much to describe. 32x40 with 12 ft walls and fully heated pole barn great for workshop--has own bath room. 32x20 in-law living quarters with 1 bedroom, laundry, full bath, kitchen, and living room. This would be ideal for adult children, guests, in-laws, AIR BNB, etc. Main home features 4 beds, 3 baths, full basement partially finished and plumbed for 4th bath. Home comes with outdoor wood boiler that heats the entire home, barn and in-laws quarters. Never pay a heat bill again! One storage shed included the other possibly. Plenty of wildlife around this home. Kitchen has knotty pine floors, granite counters and tiled backsplash. All appliances included. Living room and family room great for entertaining. Formal dining too. Back up auto generator too. This home has everything you want and is move in ready.